Presenting a feat of daring never before attempted in podcasting—well, not on purpose anyway: Over an hour’s worth of specially handcrafted silence. That is right! Pure, unadulterated silence. However, due to a mix-up at the studio, listeners may experience a spot here or there where the vacuum of sound is partially broken up by some detectable levels of auditory stimuli by such POUNDERS as the Lone Twister, Left Arm, The Jinxes, Dean Morgan, Satan’s Pilgrims, The Inner Thoughts, Dynamites, Ray Daytona and the Googoobombos, Jumpin’ Beans and Willie, the Jungle Rockers, and maybe 11 or 12 other acts. 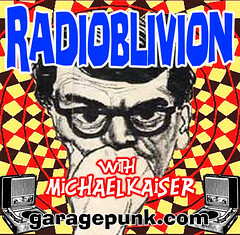 An experiment in sound brought to you by Michael Kaiser in association with the GaragePunk Podcast Network. Blow Yer Radio Up, Baby! !